Equity’s not an option but laughter makes it happen more, Inuit elders told me when I facilitated leaders on Baffin Island, near Greenland. Unsure why your workplace acts as if all humans were not its highest currency? Wonder why we wage wars at work that kill opportunities and maim innocent people? Question why bumps and bruises strike down daily when you least expect? Stress increases from discrimination, and lack of healthy humor at work increases cortisol, a dangerous hormone that can be at odds with brainpower. No surprise that cortisol can decrease brainpower, since this mental toxin literally shrinks a brain itself, and can shave years off life. Have you seen it happen? Few deny that inequity and diminished brainpower define toxic workplaces, yet Inuit leaders laugh as a serotonin tactic to lower unfair barriers. Their humor appears opposite to what you typically hear about workplace challenges. 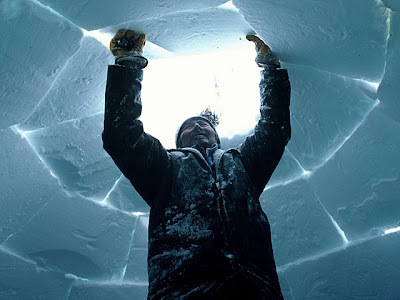 No question, multiple intelligences transform talents into tools, but Inuit hunters emphasized different intelligences as they circled the frozen bay outside my front window daily. Dogs raced sleds toward floe edges, where narwhal, seals, caribou, polar bear became food, clothing and even tools from young hunters to cherished elders. Notice the brainpower exchange for equity? In turn, seniors taught youth to navigate rugged tundra far north of tree lines. They told endless stories about sounds near the lip of icebergs that can help hunters distinguish roars of ice cracking off glaciers. Golden lessons shared in ways that prevented hunters from tumbling to their death in dangerous Arctic seas. High Arctic communities also laugh together often. Elders allow youth to use them literally as wheelbarrows for community races on Friday evenings. Comedy carries over into challenges work, where Inuit’s proclivity to laugh, often left me laughing too. I remember one amazing skidoo race to the Igloolik Airport. Because of blizzards I narrowly caught my plane to a remote community near Greenland until Cecilia, head of Government Social Services, roared up to my home on the only vehicle anybody could find – a skidoo. Happy for transport to my flight, we hopped on, piled four bags around and under us, and packed snow around the biggest bag against a bank of snow, for Cecilia to retrieve later. What a ride! Laughing all the way, Celia zoomed through Igloolik’s snow-packed, uneven ditches, out of town to the airport, as if headed down Aspen Mountain in a top ski race. Snowmobile heaving from side to side, we skidded into gullies over bumps and teetered on the edge of snow banks while I held blowing bags, and held my breath. Not dressed for a skidoo in sub zero temperatures, I was unprepared for the rugged terrain, bags flying in the wind, my frozen face, and Cecilia’s expression of sheer conquest over Arctic elements. “No problem.” I shot back, “Could have been me flying off your skidoo.” We all laughed! Inuit leaders show how fair play reduces unfair hurdles, through openly shared talents, and laughter. Have you seen it? Brain Drain or Brain Gains?